Hanoi aims to reduce the use of plastic bags in the traditional markets, supermarkets and trade centres to protect the environment as well as ensure the sustainability of the ecosystem. This is the action plan of the Hanoi People’s Committee that aims to implement the sustainable production and consumption programme by 2020. The city also plans to increase the percentage of enterprises in industrial parks and complex applying eco-friendly technologies to 60-70 percent. Under the plan, Hanoi will raise public awareness of the use of plastics, urge and educate enterprises to trade plastic products and nylon bags for recyclable materials instead. Most of the city’s markets and supermarkets do not use eco-friendly plastic bags, the Lao Dong (Labour) newspaper reported. Do Thi Mai, a fruit shop in Linh Nam ward, Hoang Mai district, said she consumed over 1kg of nylon bags a day. “I know using plastic bags will pollute the environment but I still have to use every day because customers need. We will stop when there is a ban,” she said. Regarding the use of plastic bags and the long-term effects of them, the Ministry of Natural Resources and Environment said plastic bag waste has a serious impact on the environment and human health. Vietnam is among the top five polluting countries worldwide, which together contribute as much as 60 percent of all plastic waste that enters the world’s seas. 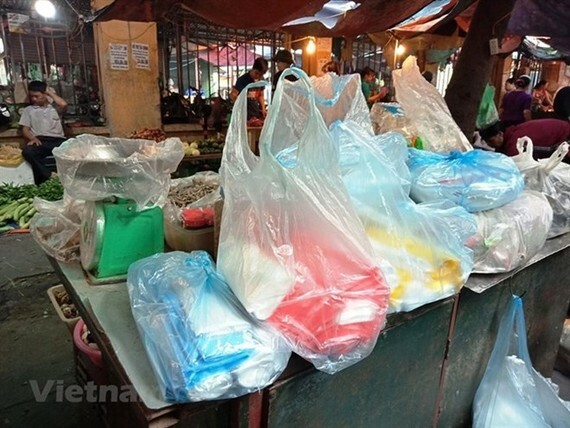 Only two large cities, Hanoi and HCM City discharge about 80 tonnes of plastic and plastic bags each day, of which most plastic bags are difficult to decompose, according to the ministry. “If 10 percent of plastic waste is not recycled, the amount of plastic discharged in the country will reach 2.5 million tonnes per year,” a representative of Ministry of Natural Resources and Environment was quoted by the newspaper as saying. Traditional, non-biodegradable plastic bags are subject to an environmental tax of 40,000 VND (1.70 USD) per kg. Tax is set to increase to 50,000 VND (2.10 USD) as of January 1, 2019 while plastic bags are sold at the markets at 35-40,000 VND per kg. Price of plastic bag is equivalent to environmental protection tax, tax loss is clear, the newspaper said. Legal loopholes have enabled widespread tax evasion that has caused huge financial losses for the State and limited the effectiveness of the tax. To avoid tax losses with plastic bags, it is needed to amend the regulations related to environmental protection tax, according to Pham Dinh Thi, Director of the Ministry of Finance’s Tax Policy Department. Dr Nguyen Minh Phong, an economic expert also agreed. Raising public awareness of bout the harmful effects of plastic bags was a solution to reduce plastic use but would not solve the root of the problem, he said.